A mass of marine debris discovered in a giant sinkhole in the Hawaiian islands provides evidence that at least one mammoth tsunami, larger than any in Hawaiʻi’s recorded history, has struck the islands, and that a similar disaster could happen again, new research finds. Scientists, led by Rhett Butler, Director of the Hawai‘i Institute of Geophysics and Planetology (HIGP) at UH Mānoa, are reporting that a wall of water up to nine meters (30 feet) high surged onto Hawaiian shores about 500 years ago. A 9.0-magnitude earthquake off the coast of the Aleutian Islands triggered the mighty wave, which left behind up to nine shipping containers worth of ocean sediment in a sinkhole on the island of Kauaʻi. 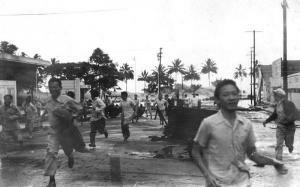 The tsunami was at least three times the size of a 1946 tsunami that was the most destructive in Hawaiʻi’s recent history, according to the new study that examined deposits believed to have come from the extreme event and used models to show how it might have occurred. Tsunamis of this magnitude are rare events. An earthquake in the eastern Aleutian Trench big enough to generate a massive tsunami like the one in the study is expected to occur once every thousand years, meaning that there is a 0.1 percent chance of it happening in any given year – the same probability as the 2011 Tohoku earthquake that struck Japan, according to Gerard Fryer, a geophysicist at the Pacific Tsunami Warning Center in Ewa Beach, Hawaiʻi. Nevertheless, the new research has prompted Honolulu officials to revise their tsunami evacuation maps to account for the possibility of an extreme tsunami hitting the county of nearly 1 million people. The new maps would more than double the area of evacuation in some locations, according to Fryer. Hawaiians have told stories about colossal tsunamis hitting the islands for generations, but possible evidence of these massive waves was only first detected in the late 1990s when David Burney, a paleoecologist at the National Tropical Botanical Garden in Kalaheo, was excavating the Makauwahi sinkhole, a collapsed limestone cave on the south shore of Kauaʻi. Two meters (six and a half feet) below the surface he encountered a layer of sediment marked by coral fragments, mollusk shells and coarse beach sand that could only have come from the sea. But the mouth of the sinkhole was separated from the shore by 100 meters (328 feet) of land and seven-meter (23-foot) high walls. Burney speculated that the deposit could have been left by a massive tsunami, but he was unable to verify the claim. The deposits remained a mystery until the Tohoku earthquake hit Japan in 2011. It caused water to surge inland like a rapidly rising tide, reaching heights up to 39 meters (128 feet) above the normal sea level. After that tsunami deluged the island nation, scientists began to question Hawaiʻi’s current tsunami evacuation maps. The maps are based largely upon the 1946 tsunami, which followed a magnitude 8.6 earthquake in the Aleutian Islands and caused water to rise only two and a half meters (8 feet) up the side of the Makauwahi sinkhole. To find out, the study’s authors used a wave model to predict how a tsunami would flood the Kauaʻi coastline. They simulated earthquakes with magnitudes between 9.0 and 9.6 originating at different locations along the Aleutian-Alaska subduction zone, a 3,400-kilometer (2,113-mile) long ocean trench stretching along the southern coast of Alaska and the Aleutian Islands where the Pacific tectonic plate is slipping under the North American plate. The researchers found that the unique geometry of the eastern Aleutians would direct the largest post-earthquake tsunami energy directly toward the Hawaiian Islands. Inundation models showed that an earthquake with a magnitude greater than 9.0 in just the right spot could produce water levels on the shore that reached eight to nine meters (26 to 30 feet) high, easily overtopping the Makauwahi sinkhole wall where the ocean deposits were found. The authors used radiocarbon-dated marine deposits from Sedanka Island off the coast of Alaska and along the west coasts of Canada and the United States dating back to the same time period as the Makauwahi deposit to show that all three sediments could have come from the same tsunami and provide some evidence that the event occurred, according to the study. “[The authors] stitched together geological evidence, anthropological information as well as geophysical modeling to put together this story that is tantalizing for a geologist but it’s frightening for people in Hawaiʻi,” said Robert Witter, a geologist at the U.S. Geological Survey in Anchorage, Alaska, who was not involved in the study. According to Witter, it is possible that a massive tsunami hit Hawaiʻi hundreds of years ago, based on the deposits found in the Kauaʻi sinkhole, but he said it is difficult to determine if all three locations experienced the same event based on radiocarbon dating alone. Radiocarbon dating only gives scientists a rough estimate of the age of a deposit, he said. All three locations offer evidence of a great tsunami occurring between 350 and 575 years ago, but it is hard to know if it was the same tsunami or ones that occurred hundreds of years apart. “An important next thing to do is to look for evidence for tsunamis elsewhere in the Hawaiian island chain,” said Witter. Fryer, of the Pacific Tsunami Warning Center, is confident that more evidence of the massive tsunami will be found, confirming that events of this magnitude have rocked the island chain in the not-so-distant past. Fryer is so convinced that he has worked with the City and County of Honolulu to update its tsunami evacuation maps to include the possibility of a massive tsunami the size of the one detailed in the new study hitting the islands. The county hopes to have the new maps distributed to residents by the end of the year, he said. 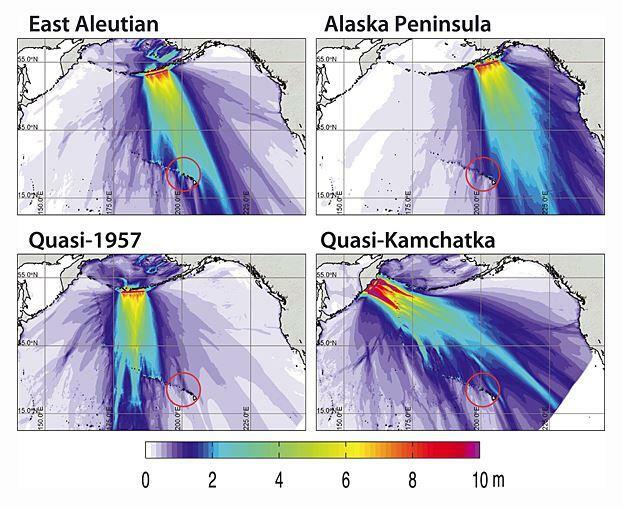 Butler, R., D. Burney, and D. Walsh (2014), Paleotsunami evidence on Kaua‘i and numerical modeling of a great Aleutian tsunami, Geophyscial Research Letters, 41, doi:10.1002/2014GL061232. The School of Ocean and Earth Science and Technology at the University of Hawaiʻi at Mānoa was established by the Board of Regents of the University of Hawai‘i in 1988 in recognition of the need to realign and further strengthen the excellent education and research resources available within the University. SOEST brings together four academic departments, three research institutes, several federal cooperative programs, and support facilities of the highest quality in the nation to meet challenges in the ocean, earth and planetary sciences and technologies.